Reports from CE National reveal that preparations for the annual Grace Brethren national youth conference, Momentum, is picking up. Staff have arrived, worksites for Katrina rebuilding projects are being evaluated, and the campus of the Univesity of Southern Mississippi is being readied for the conference. 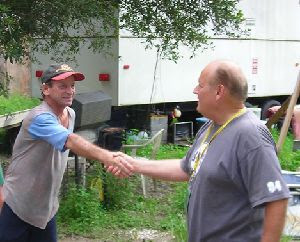 At right, Ed Lewis, executive director of CE National, greets one of the homeowners who will benefit from the Momentum work projects. For more news and information about the conference, click here. It will be updated regularly. Remember to keep the week in prayer. This is a significant time for many young people. If you’d like sign up for a specific time to pray, click here. This reporter will be headed south on Saturday and will spend the week at the conference. I’ll be assisting with news writing, presenting a Sponge Session on writing, and encouraging students to consider using their communication skills for God! Watch this blog for my regular reports of the events. For more information about Momentum, click here. If you need any help with any writing or photography stuff down there, let me know. I have a laptop and digital SLR with me, and I'd be happy to help.